It is that time of the year again, in short, pujas. For all Bengalis across the board the last 4 days of Devipakya (that is what they call this period) are the most precious times. It all starts with Mahalaya, an auspicious occasion observed seven days before the Durga Puja, and heralds the advent of Durga, the goddess of supreme power. 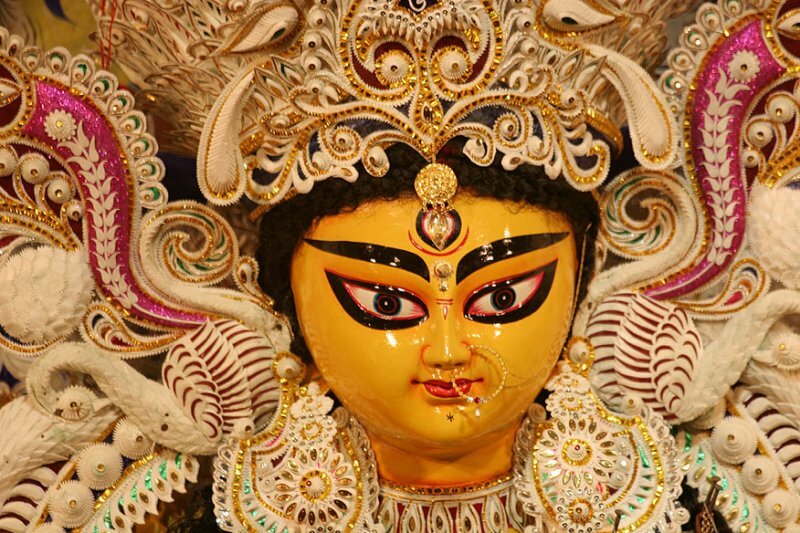 It’s a kind of invocation or invitation to the mother goddess to descend on earth – “Jago Tumi Jago”. What makes Mahalaya so famous is Maahishashur Mardini , a remarkable piece of audio drama matchless in Indian culture. Though the theme is mythical and the mantras Vedic, this program is a landmark composition. The story element is captivating. It speaks of the increasing cruelty of the demon king Mahisasura against the gods. Unable to tolerate his tyranny the gods plead with Vishnu to annihilate the demon. The Trinity of Brahma, Vishnu and Maheswara (Shiva) come together to create a powerful female form with ten arms – Goddess Durga or ‘Mahamaya’, the Mother of the Universe who embodies the primeval source of all power.The gods then bestow upon this Supreme creation their individual blessings and weapons. Armed like a warrior, the goddess rides a lion to battle with the Mahisasura. After a fierce combat the ‘Durgatinashini’ is able to slay the ‘Asura’ king with her trident. Heaven and earth rejoice at her victory. Finally, the mantra narration ends with the refrain of mankind’s supplication before this Supreme Power. Finally, this time of the year of the year is about food, All those mouthwatering classic bengali delights being dished out by our mothers and grandmothers. Recipes that have been passed down the generations and the stories, the memories along with them are invaluable, and that is what I miss most. 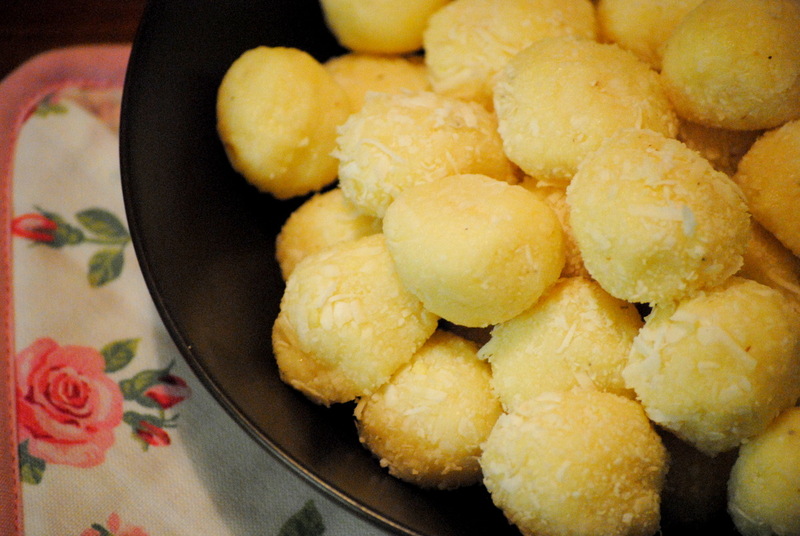 My grandma (thakuma) would make these lovely sweets of coconut and they were divine and countless . Though Thammma is long gone but her narkol Ladoos live on..
Far away from home , these are the memories you have that keep you going, Kolkata puja would only be relieved through childhood memories this year, but the narkol ladoos make them sweet. Grate or crumble the khoya if you are using the store bought. If you are making them at home, then 8 cups of milk to be reduced on low flame continuously and this will give you roughly 2 cups once reduced. Heat the milk and add the khoya (store bought ones) and cook on slow heat for 3-4 mins. Add desiccated coconut and remove from fire mix well. Allow to cool a little and add the sugar and the cardamom powder. Divide the mixture into medium size balls ( slightly smaller than golf balls) . 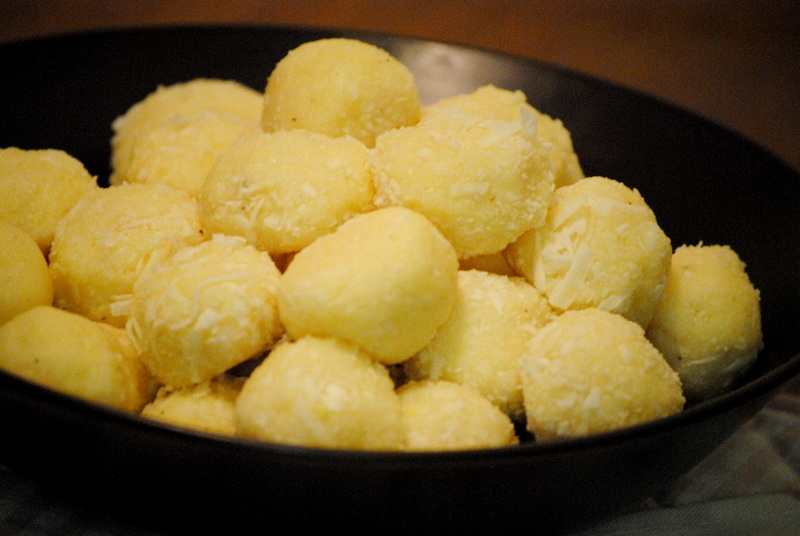 Shape each part into balls and roll in the remaining desiccated coconut. 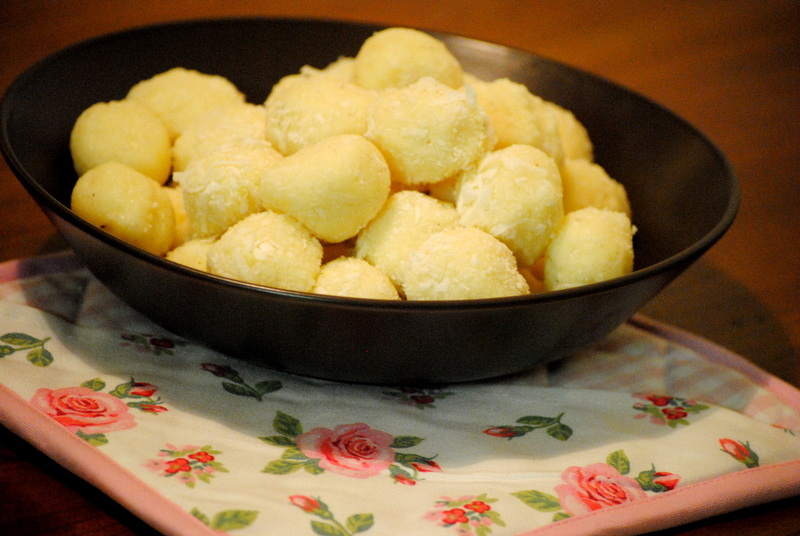 Ladoos are ready to enjoy…. To all my readers Shubho Mahalaya!!!! Previous Post Blueberry Muffins to die for..